There is an inner community inside of us, a community of selves. Some that have a voice, some that are quiet. Some that are known through sensation, emotion, thought. Other selves have agendas, advice, and accusations. Each of these selves has a history, an emotional state, and a felt sense in the body. Each represents a particular aspect or part of our (mostly) Unified Self. In mindful movement, we can substantiate selves that have been hiding, or outcast. We can learn to calm the selves that work overtime, find unknown Selves and/or embody a Self you have been waiting to become. 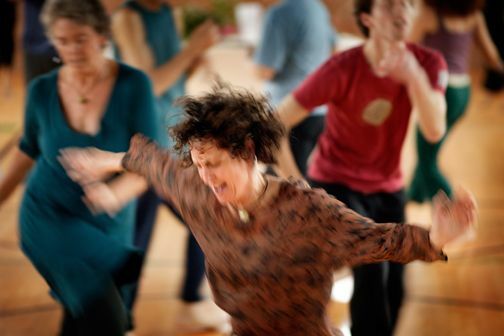 Andrea facilitates a dynamic, non-judgmental, well informed, dance playground to embody these inner conversations. Not only fun and awakening, but by exploring any distinct part of us can help us understand what is held there and what the cost is. Additionally, the creativity of dance illuminates new possibilities or choices. When we allow it, the embodiment of our different selves, supports integration, shared knowledge, and agreement within who we call “me, myself or I”. The practice of learning the ten Core Movement Resources, anchors us in the felt-sense of that which moves from one self to another. It’s often hard to taste this in our day-to-day life, but put those selves, intentionally, into movement on the Open Floor and who we are beyond a self is often surprisingly available to us. Come join us for this essential and transformative work. This price is for tuition only. Housing will be in Reunion House, with private rooms with Queen beds, shared bathrooms. Own room with queen bed in a shared house $79/night + taxes. ON-CAMPUS MEALS are required with housing and will be included in check out at an additional $48/day. Meals included are breakfast, lunch and dinner. Starting with Dinner on the first night and ending with breakfast on the last day. *Sales and room tax will be added to these prices at checkout. *There is a 2% charge for credit card payments. Becoming an attuned and skillful inhabitant of a human body has always fascinated me. Embodiment as a path of study and devotion holds the felt sense of life as we live it, the creative qualities of imagination, inspiration, and art and the transcendent qualities of presence, compassion, love and Union with Spirit. I have approached embodiment through every doorway I could find: Bodywork, Yoga, dance of all kinds, hiking, living life, being a mother, a lover, Somatic psychotherapy, meditation, thru professional trainings, academic programs and constant dedicated practice. For Information about Transportation to Port Townsend Click Here.